Hoffman, L. M. DaCosta, A. Bertrand, Y. Castonguay, and J. S. Ebdon. 2014. Comparative assessment of metabolic responses to cold acclimation and deacclimation in annual bluegrass and creeping bentgrass. Environ. Exp. Bot. 106:197-206. Hoffman L., M. DaCosta, and J. S. Ebdon. 2014. Examination of Cold Deacclimation Sensitivity of Annual Bluegrass and Creeping Bentgrass. Crop Sci. 54:413-420. Ebdon, J. S. 2014. Resistance of fine leaf fescue cultivars to red thread, 2013. Plant Disease Management Reports. T028. Ebdon, J. S. 2014. Resistance of Kentucky bluegrass cultivars to leaf rust, 2013. Plant Disease Management Reports. T029. Ebdon, J.S., M. DaCosta, J. Spargo, and W. M. Dest. 2013. Long Term Effects of Nitrogen and Potassium Fertilization on Perennial Ryegrass Turf. Crop Sci. 53:1750-1761. Murphy, J. A., and J. S. Ebdon. 2013. 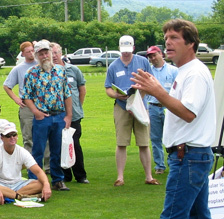 Study and Management of Turfgrass Traffic Stress. In J.C. Stier et al., editors. Agron. Monogr. 52, ASA-CSSA-SSSA, Madison, WI. p.1029-1074. Hoffman, L., M. DaCosta, J.S. Ebdon, and J. Zhao. 2012. Effects of drought preconditioning on freezing tolerance of perennial ryegrass. Ebdon, J. S., and H. G. Gauch, Jr. 2011. Direct Validation of AMMI Predictions in Turfgrass Trials. Crop Sci. 51:862-869. Dowgiewicz, J., J. S. Ebdon, M. DaCosta and W. D. Dest. 2011. Wear Tolerance Mechanisms in Agrostis Species and Cultivars. Crop Sci. 51:1232-1243. Ebdon, J. S. 2011. Resistance of Kentucky bluegrass cultivars to Necrotic Ring Spot, 2009. Plant Disease Management Reports. T040. Ebdon, J. S. 2011. Resistance of Kentucky bluegrass cultivars to Dollar Spot, 2009. Plant Disease Management Reports. T039. Ebdon, J. S. 2011. Resistance of perennial ryegrass cultivars to dollar spot (Sclerotinia homoeocarpa), 2009.Plant Disease Management Reports. T038. Hoffman, L., M. DaCosta , J. S. Ebdon, and E. Watkins. 2010. Physiological Changes during Cold Acclimation for Perennial Ryegrass Accessions Differing in Freeze Tolerance. Crop Sci 50:1037-1047. Hoffman, L., J. S. Ebdon, W. D. Dest and M. DaCosta. 2010. Effects of Nitrogen and Potassium on Wear Mechanism in Perennial Ryegrass: I. Wear Tolerance and Recovery. Crop Sci. 50:357-366. Hoffman, L., J. S. Ebdon, W. D. Dest and M. DaCosta. 2010. Effects of Nitrogen and Potassium on Wear Mechanism in Perennial Ryegrass: II. Anatomical, Morphological and Physiological Characteristics. Crop Sci. 50:367-379.